Anglicans from throughout the Caribbean have been taking part in a “Pastors and Disasters” workshop in Grenada. The workshop has been organised and hosted by the Church of the Province of the West Indies with the global Anglican Alliance, the US-based Episcopal Relief & Development, and the Canadian Primate’s World Relief and Development Fund. It was staged following a number of natural disasters and climate change-related events to hit the island nations. The participants at this week’s workshop, at St Martin’s Retreat Centre in Grenada, are from the West Indies’ dioceses of Jamaica and the Cayman Islands, Trinidad and Tobago, the Windward Islands, Guyana, and North Eastern Caribbean and Aruba; as well as the Episcopal Church’s Diocese of the Virgin Islands. 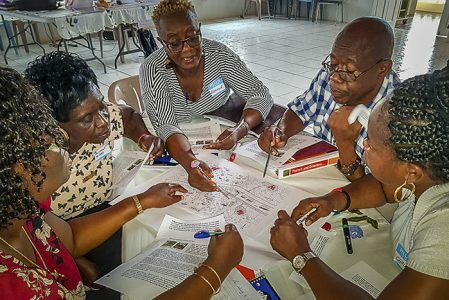 They have been sharing their own experiences of disaster preparedness and resilience, learning best practice using the Pastors and Disasters Toolkit, and adapting it to the Caribbean context. The Pastors and Disasters toolkit is a resource for community-based disaster risk reduction and management created by Episcopal Relief & Development in collaboration with other Anglican agencies. It distils knowledge and experience gathered from across the Anglican Communion and provides tried and tested practical tools for churches to respond effectively. “I have enjoyed that the workshop has been so practical”, Tina Beazer, the Long Term Recovery Director of the Virgin Islands Diocese, said. “I love that it is a process and you can follow the process. She added: “It gave us practical experience of the reality of using the tools. Thinking about our context, with a huge expanse with three suffragan bishops, we will need to break the work up and work in each of the regions. The Anglican Alliance’s Disaster Response and Resilience Manager, Dr Janice Proud, said, “It is exciting to have such an enthusiastic group from across the Caribbean coming together to learn how to plan and prepare for disasters. “We greatly appreciate the support of the bishops in the region for their wise selection of people to come and learn how to support the dioceses develop a preparedness plan. Participants have greatly appreciated both the focus of the toolkit on the role of the church and the participatory learning style that allows for adaptation to the local context.